There was no primary or special election in North Carolina yesterday and the Democratic candidate, Dan McCready, is a Blue Dog who will be voting frequently with the GOP when he gets into Congress-- Blue Dogs always do. But with the existential danger of Trump hanging over us, with have to hold our noses and hope congressional candidates like McCready win. And in this case, we probably don't have to hope too hard, because he's very likely to win. His opponent, far right crackpot Mark Harris (R) keeps saying women must submit to their husbands. I'm sure there are some people who will love that message. But not enough to win in a district that includes lots of well-off suburbs of both Charlotte and Fayetteville. He also keep denouncing homosexually as "evil." Harris is from another time and another North Carolina. One more thing before I get to yesterday's results. 43% of Republicans-- not 43% of voters, just members of the Trump Party-- think Trump should be able top shut down media outlets he doesn't agree with. I guess, as a people, as a nation, we need to shut down the GOP. No one thought that was going to hold for long once yesterday's votes started coming in, especially votes from Licking, Muskingum, Morrow and Richland counties. Once over 70% of the votes were counted, it became a see-saw race depending whether red precincts or blue precincts were being counted. 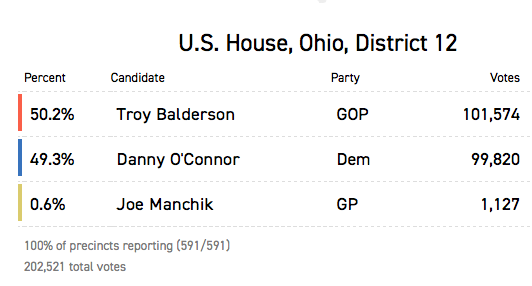 In the end, Balderson won with 101,574 votes (50.2%) to O'Connor's 99,820 (49.3%), so 1,754 votes separating them. It doesn't look to me that even if provisional votes go for the Democrats (in 10 days) it will be enough to turn the race around. Balderson and O'Connell will meet again in November where Balderson is unlikely to have $6 million in independent expenditures on his behalf. Once votes started rolling in in KS-04, James Thompson started building a landslide victory over Laura Lombard. He's the Wichita progressive who ran an extraordinarily good campaign, highlighted by Bernie and Alexandria doing a massive get-out-the-vote rally with him in Wichita. He beat Laura Lombard 65.3% to 34.7%. And he'll need help to beat Trump enabler Ron Estes in November. You can help him here. 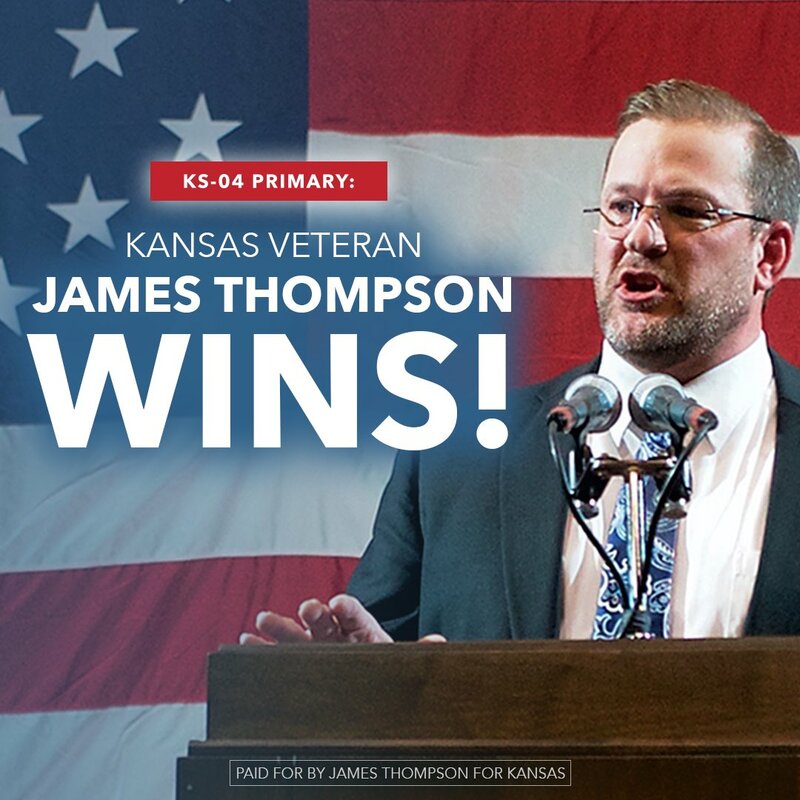 In the other important Kansas race (the 3rd district), the ultimate identity politics candidate, Sharice Davids, edged progressive Brent Welder in a 6-person race-- 22,891 (37.3%) to 20,803 (33.9%). She's likely to make a good member of Congress though. In the gubernatorial race, the Democrats got their strongest candidate, state Senator Laura Kelly with a landslide. On the Republican side, two far right Republicans faced off against each other, appointed incumbent Jeff Colyer and neo-fascist, Trump-endorsed Kris Kobach. This is probably headed for a recount. Kobach pulled ahead this morning by 0.1%-- 126,257 (40.6%) to 126,066 (40.5%). Now that's close! In the Michigan gubernatorial contest, the Republicans picked the far right candidate, Bill Schuette and the Democrats went with the status quo candidate, Gretchen Whitmer over progressive champion Abdul El-Sayed. The fake Democrat Shri Thanedar, who seemed to be in the race solely to draw off votes from El-Sayed, played the role of spoiler. The hot Democratic congressional races were in MI-06, MI-09, MI-11 and MI-13 (special and general). 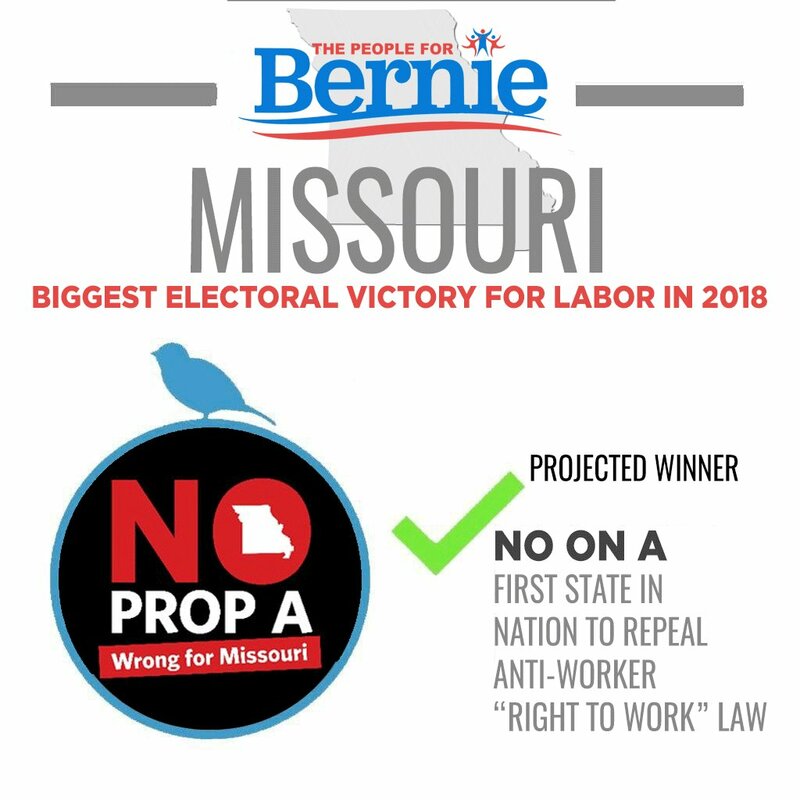 I was very nervous that in the 6th, the slimy Republican lobbyist masquerading as a Democrat (George Franklin) would slip in with the two progressives, Matt Longjohn and David Benac splitting the progressive vote. It didn't happen that way. Longjohn is a brilliant physician and in November he'll offer Fred Upton his strongest battle ever. He beat Franklin 22,077 (37.1%) to 17,222 (28.9%). In the 9th district, Andy Levin beat the more progressive Ellen Lipton 52.5% to 42.4%. Haley Stevens will be the candidate in MI-11 to face Republican Lena Epstein. There were 5 canddiates from each party and 88,715 Democrats voted, while 84,961 Republicans voted; good indicator for November. 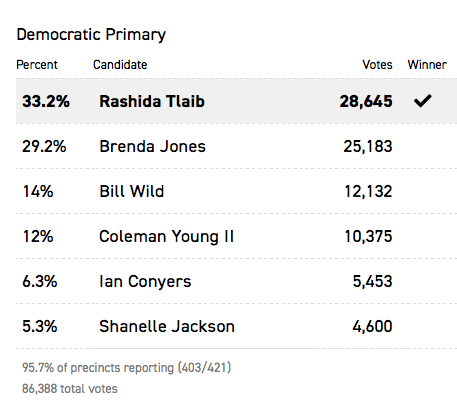 And in the Michigan district we were watching most closely, the open 13th, Rashida Tlaib won the 6-person contest for November, although appears to have lost the special election to Brenda Jones. Having Rashida in Congress starting in January will be a huge boon to the progressive movement. Washington state has a jungle primary system, like California's, where all candidates run on the same ballot, regardless of party. 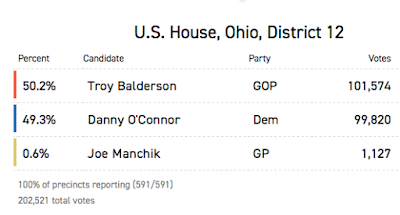 The good news is that all the strongest Democratic candidates emerged in the 3 Republican-held vulnerable districts. 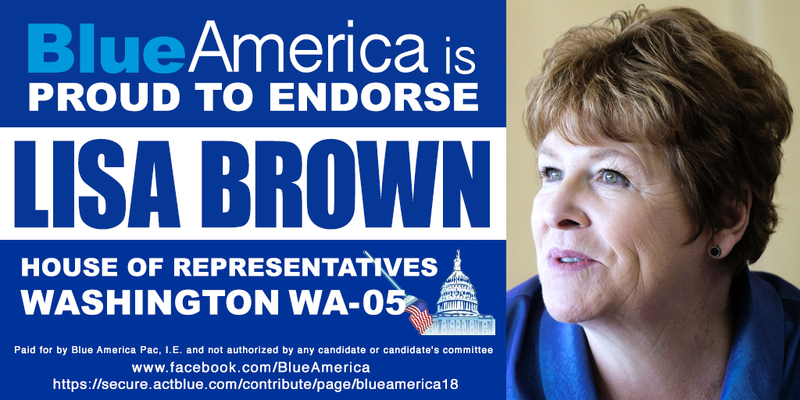 In WA-03 Carolyn Long will be the candidate against Jaime Herrera Beutler. Just a few votes separate Lisa Brown (D) from GOP incumbent Cathy McMorris Rodgers (R) and they will face off in November in a race that will be one of the biggest deals of the cycle. And in the wide open 8th district, where incumbent Dave Reichert is retiring, the two top candidates are wing nut Dino Rossi and Democrat Kim Schrier, although 32% of the precincts were yet to report this morning. It looks like there were far more votes for the 4 Democratic candidates than for the 3 Republican candidates, a good sign for November. It still isn't clear if New Dem Adam Smith will face Republican Doug Basler or progressive Democrat Sarah Smith in November. Supposed Democrat Senator Joe Donnelly just announced his support for funding a border wall with Mexico. Remember to vote for Democrats in November - they will fight Trump - NOT! How many times are you willing to get fooled? "I guess, as a people, as a nation, we need to shut down the GOP." And how do we do that with a Party full of Blue Dogs and New Dems? Correct they all have to go.